For me, using social media is all about experimentation. Try something. If it works, try it again. Didn’t work so well? Tweak it a little and try again. Recently, I have been experimenting with Facebook Questions. I have tried a few that worked really well. I’ve seen others flop. So I wonder. Did I ask an uninteresting question? Did I ask it at the wrong time? Did I, perhaps, not ask the right people? Have I bugged my friends with asking too many questions in a short amount of time? It’s really difficult to filter through all those variables. Really, the only way to find out is to wait awhile, tweak my method, and try again. Or to invite others to try and see what type of results they get. You can tell a question is really “working,” if a lot of people you don’t know answer it. Once people answer a Facebook question, the fact that they answered it (and their answer) shows up in their newsfeed. If the question is intriguing enough, people will answer it, even if they don’t know the person who asked the question. A question is effective when it engages people enough that they add their own answers or add comments. Creating a question and asking a few friends doesn’t take much time at all. It’s a great way to invite engagement on your Facebook fan page. EXCEPT… you can’t ask your fans. For some reason, you can only ask your friends. I had hoped that using questions on a fan page would net the page more fans. Unfortunately, I haven’t seen that happen much, even when I have added a comment asking folks to like the page. People typically answer the question, comment (or not), and move on. 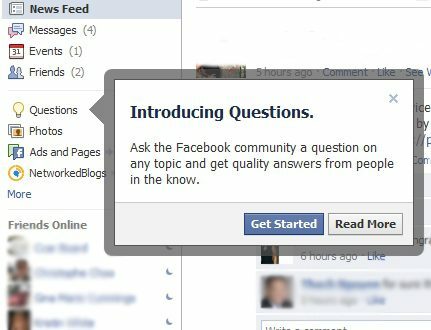 What have you learned from experimenting with Facebook questions? I’d love to know! Want to see an example of a question that did well? Check out this one — Do you check email while on vacation?. Want an example of a question that flopped — Do you feel guilt about the time you spend on social media channels? Take a look at this one. Note: All of my posts on this site will be 12 minute blog posts. Here are the rules for a 12 minute post. I set my timer and start writing. When it runs out, I’m done. Once I am done, I can spend a few more minutes to read over for minor edits, to add links or upload an image. Want to hear more about how to write a 12 minute blog post? Read this post… or this one. Thanks for this post, Becky. Facebook Questions is something I just haven’t experimented with at all yet. It seems like a place I should spend some time. As always, if you want powerful responses, you just ask powerful questions. Thanks for leaving the very first comment ever here at 12minutesocialmediaplaybook.com. I appreciate your input. Once you’ve tried out Facebook questions, I’d love to hear some of your thoughts! I believe there are a lot of factors that affect the success of a good poll, here are some of my learnings. The two best polls, provided a quote or information from an article and asked to select their perspective based on the content. Both were directly related to my page’s purpose. I also had better responses when I asked friends to respond right away. I tested asking a few days later, and didn’t get as much interaction. I will continue to try polls to engage my audience, I am having fun with it! Thanks for sharing your experience and learning. That is an interesting proposal… I like it and my wheels are turning! A potential contest experiment is in my near future: I could run a contest where Fans are invited to ask a question on the page. The question with the highest virality wins a fabulous prize (aren’t they always fabulous?). To further the question about why Facebook limits the asks to your Friends only… is it possible that they want you to “friend” all your “fans”? I had 10 fans that were not friends, and I invited them this week. Now my fans are my friends.